Eleanor Wilson McAdoo writes Jessie Wilson Sayre with news from St. Mary's School in Raleigh, NC. You don't know how glad I was to get your dear letter. I think I have read it about six times like I always do all of your letters. They are so precious. It was alright about not having written before because I have been just as bad sometimes.Oh, how I wish I could have seen the Senior Dramatics. It must have been splendid and such a lot of fun. Weren't you something in it, too? or were you just behind the scenes. I wish I could have been there too. You know, we are have just finished reading “aAs You Like It” in Senior English and I remembered about your having it in Baltimore and thought about youI had to stop and go to lunch then and now it is Sunday and I don't know what you will think of me. I am so ashamed of myself, but I declare I never have been so rushed as I've been this last week. We are having all the dozens of “Muse” pictures taken and it certainly does take time and energy—“having your beauty struck”! Besides having to be in a lot of the groups, you are, being an associate senior, I'm on the board too and it certainly is a bore. We have started in with Lent now and my goodness, we certainly do have a lot of church—even more than usual. I wish it was over though it isn't so bad sometimes because I can eat all the candy and stuff that anybody has lying around because they have sworn off and I havent! I have made it known that I will be the general trash box for the community and have a good old time. 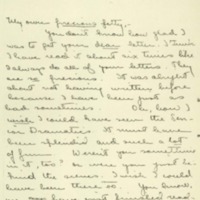 But there are no more parties or germans or any kind of frivolity so I'm afraid that my letters won't have very much to say for themselves for some time—not that they ever hadve said much, though!I couldn't go to Aunt Annie's to dinner to-day because all the authorities departed before I could catch any of them and get them to sign my little permission “effect.” So poor little Nell stay up here and eat the nasty old school dinner! Isn't it a mess—being in a horrid old boarding school where we can't go across the street with out a permission. But Helen and I are going to walk in about ten minutes—at least thats what is written on the permit blank thog though we are really going calling—on herAunt Lula and myAunt Annie and also to enquire about one of the day town girls—an A.
K.?.,—who has typhoid fever! We are so worried and distressed about her, because she isnt strong at all and I'm afraid that it's quite a serious case. Just think, Jaydaydarling, its not quite twelve weeks now before I will see you! Oh my! ist isn't that fine? It really seems right near now, doesn't it? We are having the most beautiful spring weather, just as warm and delightful as can be. We sit out in the grove as much as we can without any coats. But I can't help hoping that it will get cold again before April because I will be so tired of hot weather before the summer is over. McAdoo, Eleanor Wilson, 1889-1967, “Eleanor Randolph Wilson McAdoo to Jessie Woodrow Wilson Sayre,” 1908 March 5, WWP17433, Jessie Wilson Sayre Correspondence, Woodrow Wilson Presidential Library & Museum, Staunton, Virginia.